Santa (Edward Asner) made a bit of a mistake and brought a human baby back to the North Pole. Rather than returning him to the orphanage from whence he came, the baby, Buddy, is adopted by a senior Elf, Pappa Elf (Bob Newhart) and raised to be another Elf. But things are not smooth sailing, and eventually, Buddy must learn the truth. Discovering that his mother has passed away but his father, Walter (James Caan) is still alive, adult Buddy (Will Ferrell) goes to New York to find him, and find a new life. Around Christmas time there are always a lot of lists about best Christmas movies. I usually ignore them – I’m not really into Christmas films. There seem to be increasing numbers of houses with light displays each year in Melbourne, but regardless of complaints about the commericialisation, we don’t have the insanity that Christmas in these movies seems to have. I don’t mind a film with a bit of schmatlz or corniness, but I do find a lot of Christmas films a bit hard. 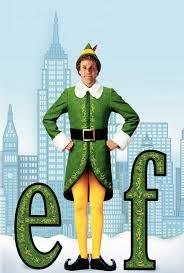 Elf is great. It’s really funny and great for kids without getting too racy, but it is not stupid. It is made very easy to totally buy into the innocence and naivety of Buddy, and how difficult he may find fitting in to modern New York. I doubt a total scrooge would enjoy it, but me? Bring it on.